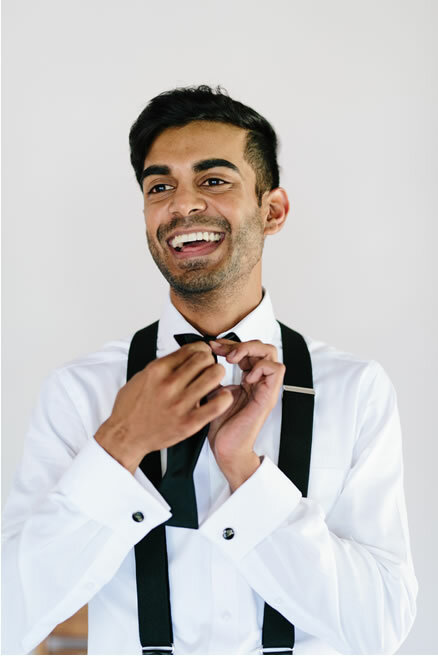 Tarryn was friends with Chad’s cousin, and this matchmaker cousin told her that he thought they would be a great match, and that all the girls love Chad!! “Alluring”, she though, so after messaging him they became the best of friends and chatted to each other often, sometimes even into the early hours of the morning. After a long three and a half year friendship Chad finally asked Tarryn to be his girlfriend in 2011. They dated for five years before he proposed, and Chad went to a lot of trouble to make it memorable. Tarryn was admitted to the bar as an attorney the day prior to the proposal, and Chad used this opportunity/theme to persuade his fiancé-to-be to be his wife! 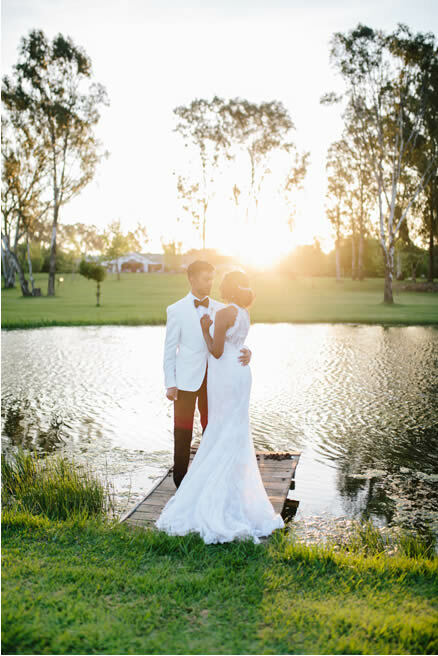 The day started off with Tarryn receiving a wax sealed note, directing her to an ‘admission surprise ‘, which turned out to be a manicure at Sorbet. This was just the start of things to come. Once done at Sorbet, she received another wax sealed note which read that her sister, Simone would be taking her out to lunch. During lunch Simone handed Tarryn another wax sealed note which stated that there was a surprise waiting for her back home. As the excitement mounted, Tarry couldn’t wait to get home. What awaited her was a large box with a beautiful white dress placed in it as well as a note requesting that she please wear the dress that evening. These best of friends say there is nothing pretentious about their relationship. 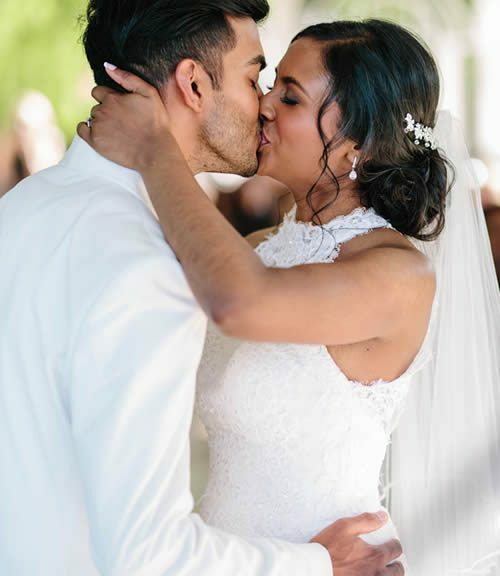 Tarryn admits that they are just two people who are enjoying life together and that they have the most fun when they are together. “We refer to ourselves as ‘The Chad and Tazz show’, it’s like our relationship together is that of a romantic comedy, or a Broadway show. (Tazz is a nickname Chad calls me)”, says Tarryn. 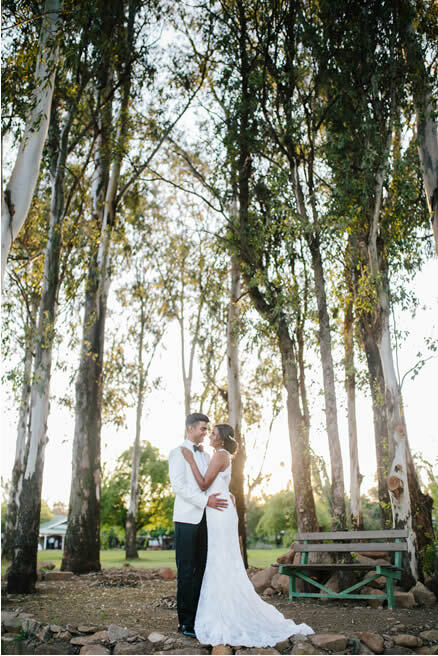 This couple chose a country venue and they say they loved the natural beauty and elegance it possessed; as well as the dam, large trees and beautiful flowers. 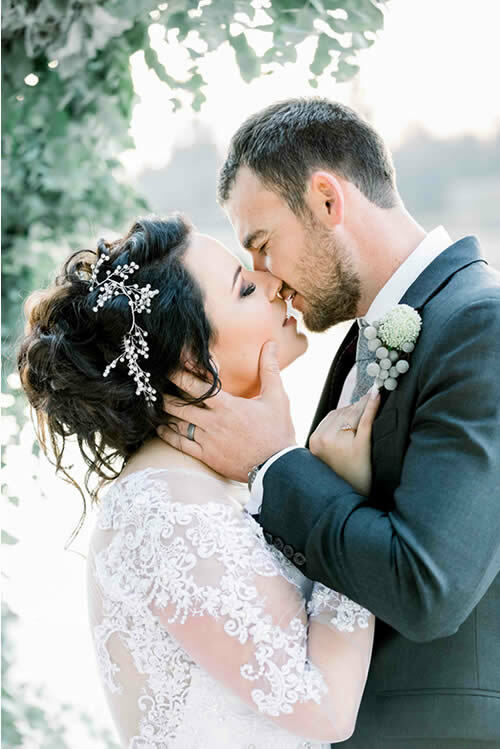 The chapel was the deciding factor for them as they found it to be breathtakingly stunning. 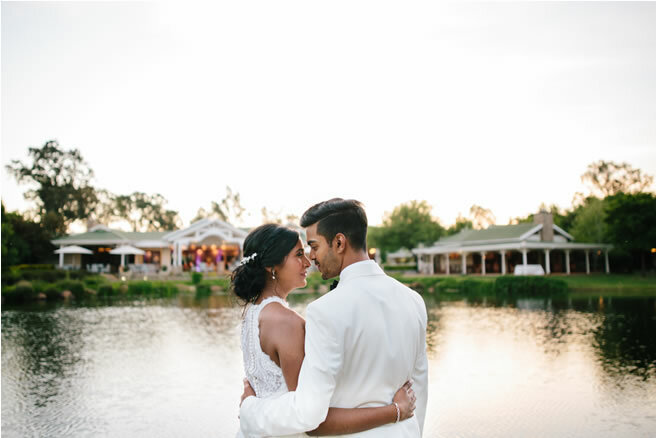 The lush gardens provided the perfect photo opportunities and the 5-star menu was unmatched in appearance and presentation for these two. The accommodation for the guests was also perfect and in mint condition. 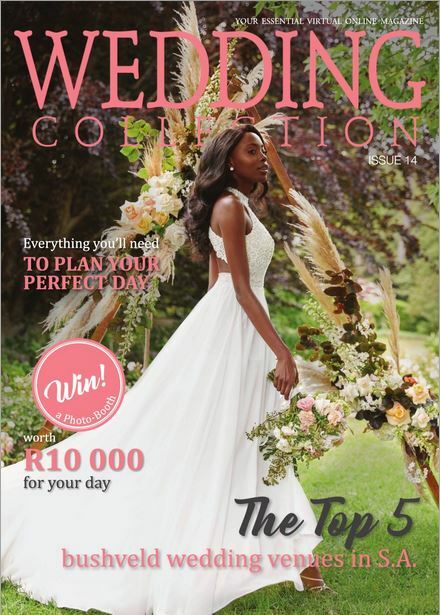 They describe their wedding day as ‘Magical’, and they set the tone for their wedding based on their real life story as the Chad and Tazz show. It was an evening show, purely based on their love story and they were the main characters of the show, Needless to say, the vision was a classic, black tie, very elegant event. 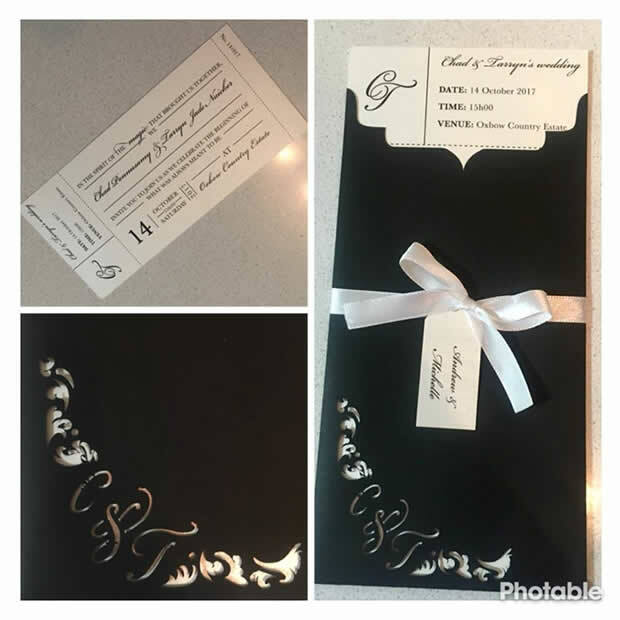 The ‘save the date’ invitation was a silhouette of them walking into a theatre, with the headline: The Chad & Tazz show, coming soon on the 14th October”, and the wedding invites had the feel of a very elegant entrance ticket to the show, also in black and white. 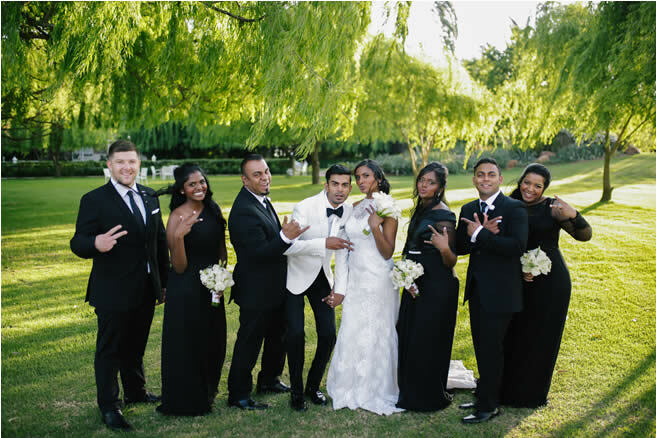 “Our theme for our wedding was that of a black tie event, incorporating the Chad & Tazz show. This was made a reality from the beginning, from the save the date invitation, the actual wedding invites, our décor, as well as the attire of guests being black tie. We further had incorporated the C&T show with our personalised ribbon on our gift favours as well as our cake topper. 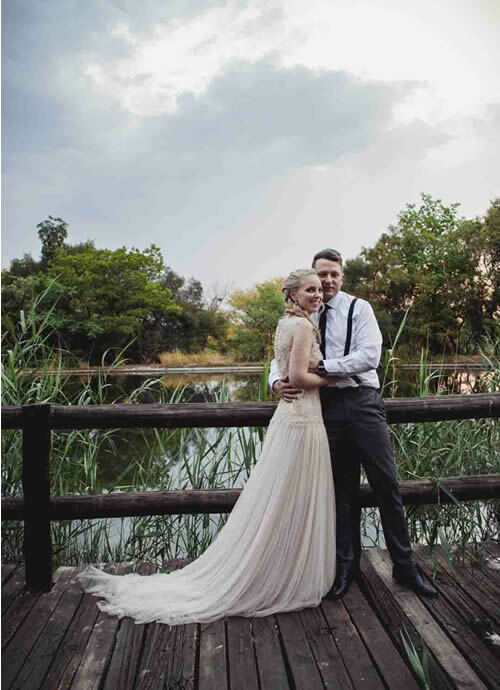 As the guests entered the reception we had the song of Coat Tails and top hats playing in the background, a very classic regal song, indeed” beams Tarryn. The vision was clearly very elegant and chic but not stuffy, still black tie but romantic. 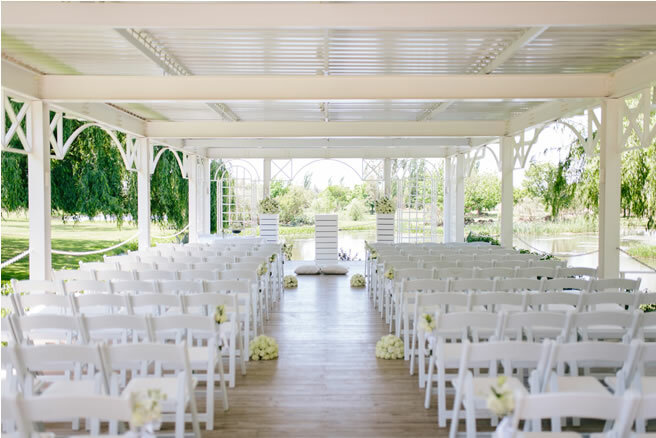 All-white flowers were used and some greenery, as well as loads of candles to create a romantic ambience. 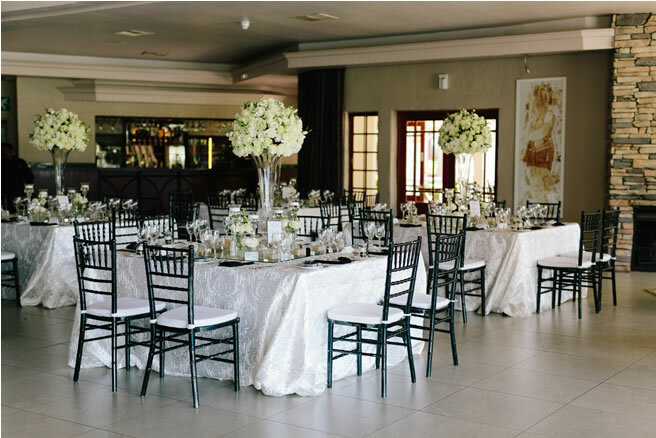 Black tiffany chairs completed the look of black and white at the reception hall. The table numbers displayed the verses of the Love verses from the Bible in Corinthians 13, i.e. Love is patient, Love is kind etc. 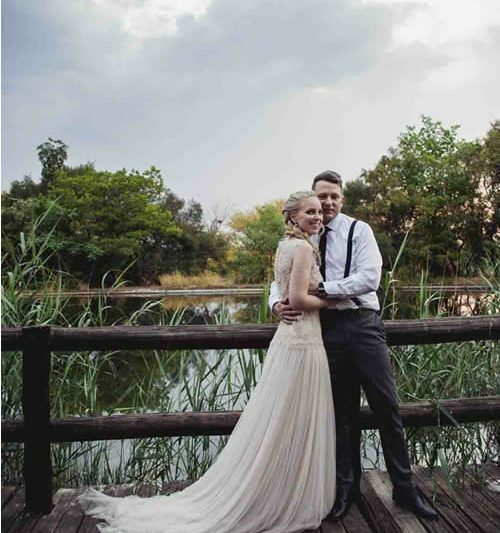 In keeping with the elegant, classy theme, Tarryn wore a full lace wedding gown, with the most beautiful high neck and lace detail. Micky and Minnie made an appearance underneath her shoes to replace the usual “I do” stickers. 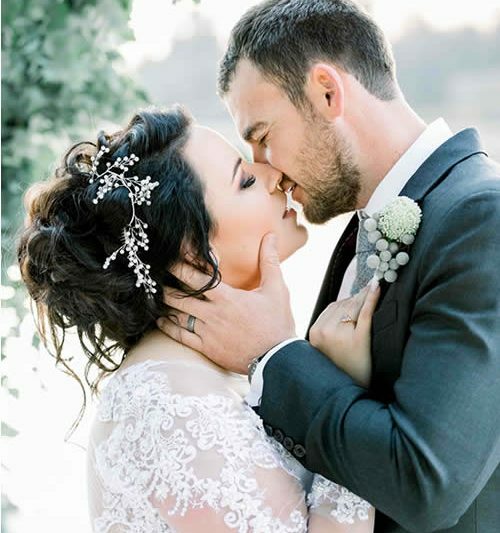 A loose, natural, up do created the romance as well as very natural make up. 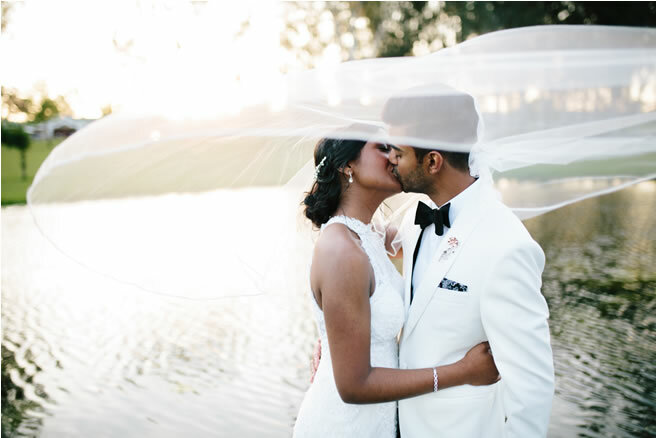 They decide on a black wedding cake, topped with white flowers and a custom made cake topper. The plated 5-star food was a show stopper in itself, which included a coriander palate-cleansing sorbet served between the starters and main course. To add to the elegance, each guest had their main plate of food served under a cloche, and a big reveal was done in-sync by the waiters at each table. 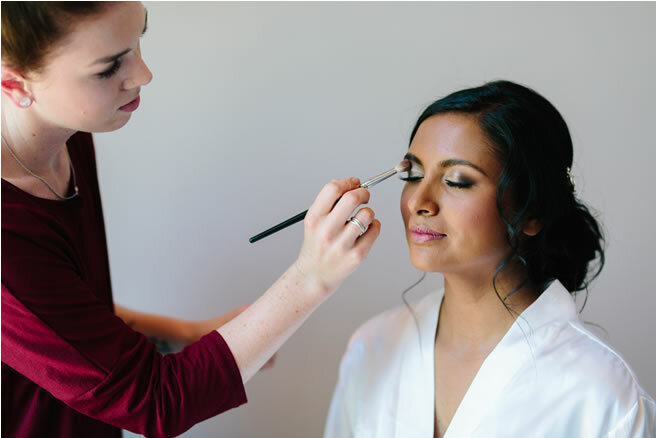 The whole process of getting ready for our big day with our girls and guys. The exchange of gifts and letters in the morning. My dad seeing me for the first time all made up, and that look on his face will be something I will always remember. 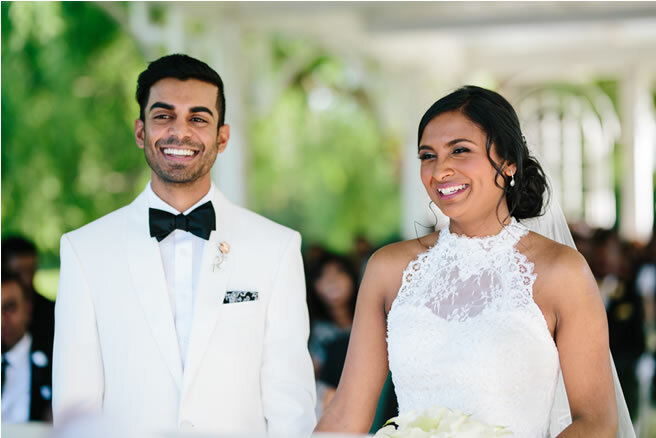 Seeing each other as I walked down the aisle, for the first time. 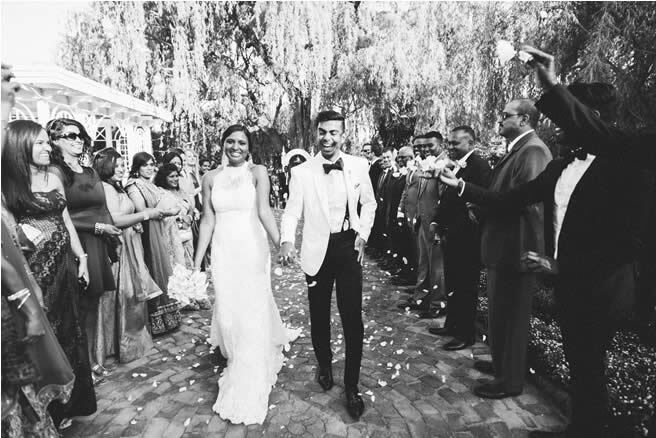 Walking through a tunnel formed by our guests after the ceremony and feeling all their love and excitement. My Husband and I dancing into the reception hall followed by all our guests sporadically joining in with us. All the speeches by our friends and parents. Our first dance – to our song ‘More than words’ by Extreme. A poem written and read to me by my husband at the end of his speech. 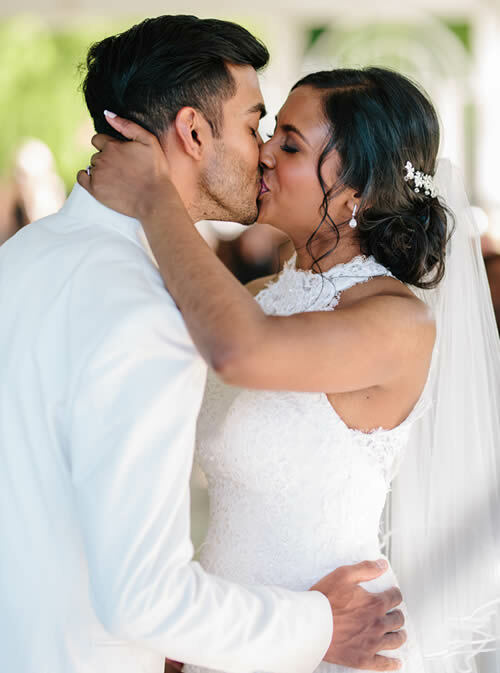 Taryn’s pearls of wisdom to brides and grooms planning their wedding day, is that you and your partner should make decisions together and not include other people in your decision making. 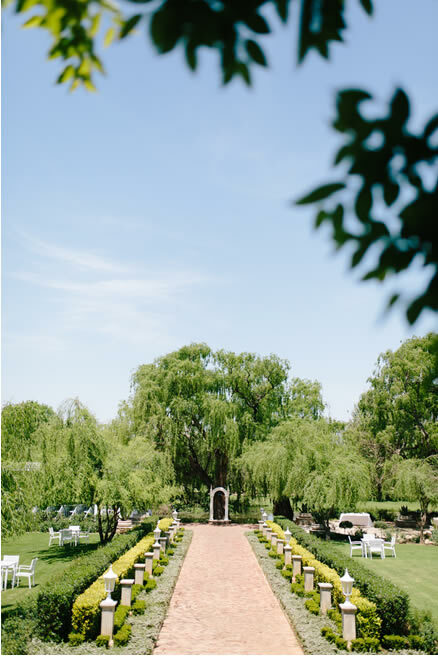 “Allow the process of planning your wedding to become a memory-making experience. Don’t stress the little things. Always remember the reason why you are doing this is because you love each other. 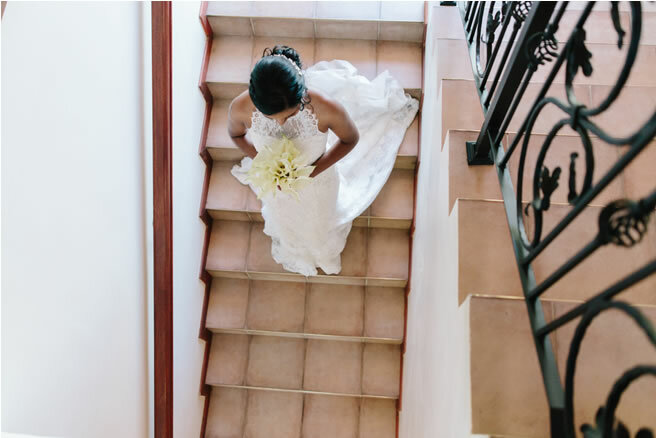 So whether your flowers are not what you expected or the cake looks different to what you chose, at the end of it all you will become husband and wife, and that is all that matters”.